Course offerings: Screwmatics of Pageland donated a computer numerical control (CNC) lathe machine to NETC’s Pageland campus, where training classes for basic machine operation will soon be offered. New career training opportunities are developing in the Pageland area, thanks to a partnership between Northeastern Technical College and several local industries. NETC will soon be offering classes in basic machine operations at the Pageland campus, preparing students for employment in high skill, high wage manufacturing jobs. Screwmatics of Pageland donated a computer numerical control (CNC) lathe machine to NETC to help meet workforce development needs for local industries. The machine was installed at the Pageland campus on Wednesday, Jan. 16, and training classes will soon be offered through NETC's Continuing Education Division. "We appreciate all the Pageland industries – PDQ South, Screwmatics, Douglas Machine Shop and Bunting Graphics – that met with Northeastern Technical College to determine training needs for the area," Dean of Continuing Education Sherrie Chapman said. "From there, we determined what equipment and other resources were needed for the college to provide training classes. 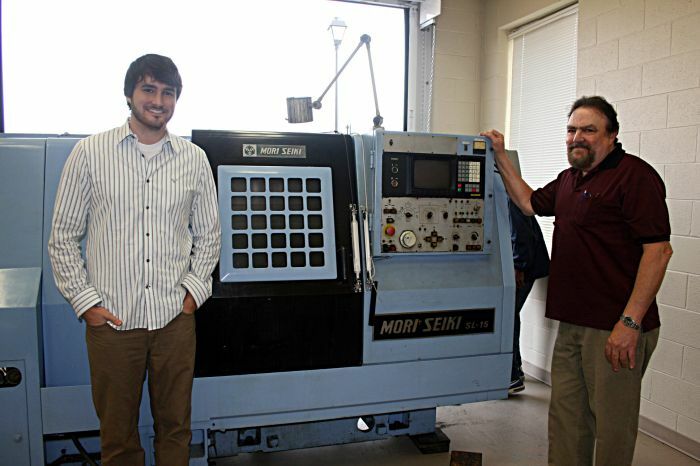 We thank Screwmatics President Tom Hogge for donating this CNC machine to the Pageland campus." Instructor for the classes at the Pageland campus will be Scrematics lead programmer Allen Conner. Students will gain an understanding of basic machine operations, including set up and programming. "This is a great opportunity for people to gain valuable skills that local employers are looking for and need," Dr. Ron Bartley, NETC president, said. "Northeastern Technical College looks forward to providing additional training opportunities as partnerships continue to develop between the college and local industries to meet their workforce needs." Dates and times of the CNC machine operation training class will soon be announced.